The term leukodystrophy refers to a group of conditions that are inherited and involve the progressive destruction or loss of previously acquired myelin.1 The most commonly reported of these disorders have a metabolic origin and are associated with abnormalities on specialist biochemical testing. Recently, a number of conditions caused by genes coding for proteins not directly involved in metabolic pathways and for which the diagnosis relies directly on gene analysis have also been described. In clinical practice, distinguishing ‘classical’ inherited leukodystrophies from other causes of white matter disease, including vascular and inflammatory disorders, may not always be straightforward. Although individually rare, with no single condition having a prevalence of >1 in 20 000, the reported prevalence of adult onset leukodystrophies is rising. This is likely to be related to the increased use of brain MRI and new genetic insights. Collectively their incidence may rival that of multiple sclerosis (MS).2 Nonetheless, the rarity of each condition and the wide differential means that diagnosis can be challenging and most clinicians will lack experience in the area. Currently, a significant proportion of individuals may remain without a precise diagnosis despite intensive investigations. ▸ current and future treatment possibilities. Table 1 summarises the most frequent of the inherited leukodystrophies that have been reported to present in adulthood (age of onset of >16 years). This list is not exhaustive and almost certainly underestimates the true numbers—with more widespread access to genetic testing it is likely that the list of potential diagnoses and actual prevalences will continue to increase. A middle aged patient presented to an MS clinic with a 2-year history of progressive gait and cognitive difficulties. Two years earlier, the patient had noted dragging of the right leg, difficulty controlling the leg and had had several falls. One year prior, clumsiness and weakness in the right hand had been noted, as well as word finding difficulties, slowness of thought, problems with episodic memory and that their writing and spelling had deteriorated. The patient had a past history of sciatica and long standing depression. The patient's mother had died at 65 years of age after a 5-year decline in gait and cognitive function, with MRI brain showing generalised cerebral atrophy and patchy signal change in the peri-ventricular white matter. The mother had been given a diagnosis of vascular dementia. There was no other family history of neurological or psychiatric illness. On examination, the patient had broken smooth pursuit eye movements and hypometric saccades. The cranial nerves were intact. The upper limb examination was normal. The lower limb examination showed increased tone and power of 4/5 on the right, with a pyramidal pattern of weakness. The reflexes were brisk throughout, with equivocal plantar responses. The gait was apraxic. On cognitive testing she scored 22/30 on the Mini-Mental State Examination. On neuropsychometric testing, there was evidence for generalised cognitive decline with marked impairments on tests sensitive to frontal and parietal lobe functions. MRI brain (see online supplementary figure S1) showed extensive white matter change predominantly affecting the frontal lobes with involvement and thinning of the corpus callosum. What is the differential diagnosis and which initial investigations should be performed? With this symptom complex and widespread white matter change on MRI, there are a number of acquired conditions that need to be excluded before an inherited leukodystrophy is considered. These include inflammatory, autoimmune, infectious, neoplastic, metabolic, drug and toxic causes. Suggested initial (Round 1) investigations are outlined in online supplementary table S1. A very rapid onset and progression over months is much more likely to be acquired than genetic, though cerebral adrenoleukodystrophy (ALD) can present abruptly. In this case, the phenotype was not one of relapsing–remitting MS, but a progressive deterioration, characterised by cognitive involvement over the previous 2 years. While progressive cognitive changes can occur in MS, the rapidity and severity are unusual. There also seems to be a possible dominant or maternal family history, which can occur in MS, but again uncommonly. The following Round 1 investigations were normal or negative: full blood count, electrolytes, liver function tests; autoimmune and vasculitic screen. CSF examination revealed a mildly elevated protein of 0.58 g/L (normal <0.40 g/L), no white cells and was negative for oligoclonal bands (<5% of cases of MS).38 Visual evoked potentials showed no abnormalities and nerve conduction studies were normal. What other information may be helpful in directing investigations? (A) Family history: This, if present, can be very informative (table 1). In establishing the inheritance pattern of a condition, the occurrence of sporadic cases, non-paternity, misdiagnosis in previous generations/other family members and a varied phenotypic presentation of the same disorder within a family should be considered. (B) Ethnicity: The ethnic background of the patient may be helpful in focusing investigations (table 1). Conditions such as mucolipidosis, adult onset gangliosidosis and adult polyglucosan body disease are more common in the Ashkenazi Jewish population, whereas megalencephalic leukodystrophy with cysts is more common in those of Asian-Indian or Turkish ethnicity. (C) Clinical presentation: Table 2 details particular clinical presentations that may point to a certain leukodystrophy. Absence of a feature does not however exclude a condition. (D) MRI pattern: Specific changes on brain MRI can have diagnostic utility, but there is considerable overlap among disorders (table 3/figure 1). Table 3 details the MRI findings classically associated with the various leukodystrophies. Figure 1 illustrates the typical site of brain MRI changes for particular conditions. 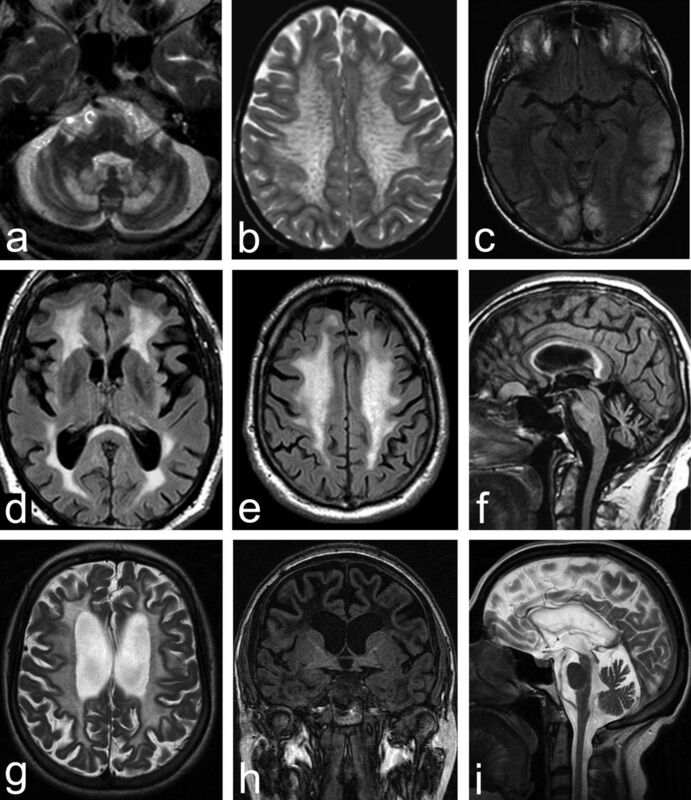 Figures 2 and 3 show brain MRI scans of adult patients with confirmed leukodystrophy. Additional information can be obtained from cervical imaging (eg, spinal cord atrophy seen in adult polyglucosan body disease) as well as cranial imaging and the use of contrast enhancement (eg, Alexander disease). Schiffmann and van der Knapp39 provide a diagnostic algorithm using MRI for the diagnosis of white matter disorders that uses features such as the location of white matter change and the involvement of the peripheral nervous system to aid diagnosis. Schematic illustration of characteristic anatomical distribution of MRI abnormalities on normal MRI sequence panels, clockwise from the top: axial T2-weighted section at the level of the centra semiovale, midline sagittal T1-weighted section through the corpus callosum, brainstem and upper cervical spinal cord, axial T2-weighted section through the temporal poles, cerebellum and dentate nuclei and axial T2-weighted section through the basal ganglia. 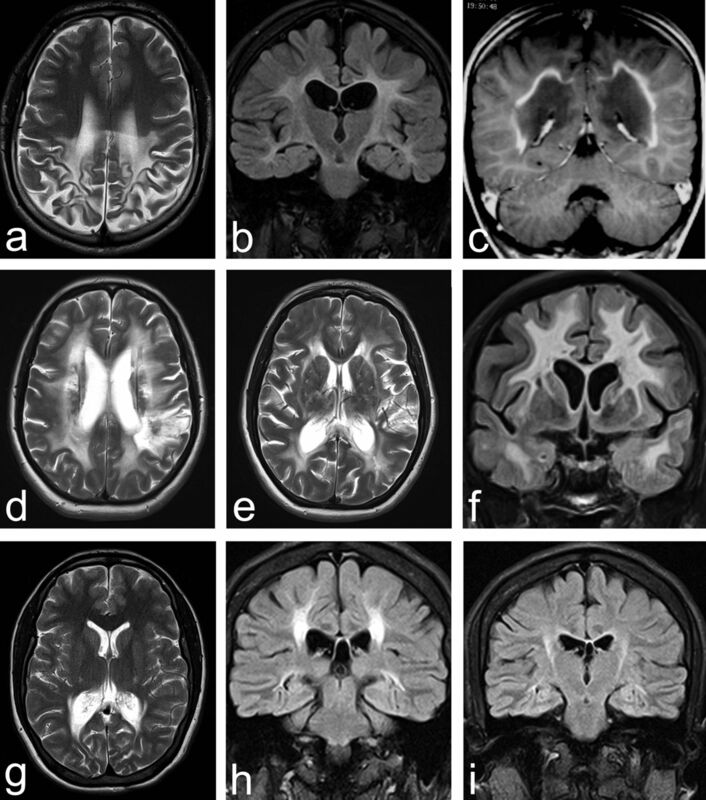 MRI brain acquisitions of: X linked adrenoleukodystrophy on axial T2-weighted (a), coronal FLAIR (b) and coronal postgadolinium contrast (c) sequences showing diffuse white matter signal T2-weighted hyperintensity and volume loss of the posterior frontal, posterior callosal and parieto-occipital regions, extending along the corticospinal tracts through the internal capsules and temporal periventricular white matter. Peripheral enhancement of the parieto-occiptal confluent symmetrical signal abnormality is demonstrated. Cerebral autosomal dominant arteriopathy with subcortical infarcts and leukoencephalopathy on axial T2-weighted (d, e) and coronal FLAIR (f) sequences showing diffuse symmetrical white matter hyperintensity extending through the external capsules and temporal poles with multiple mature subcortical and a left superior parietal cortical infarcts. Krabbe disease (globoid cell leukodystrophy) on axial T2-weighted (g) and coronal FLAIR (h, i) sequences showing posterior periventricular and deep white matter hyperintensity and volume loss involving the corticospinal tracts and splenium of the corpus callosum. MRI brain acquisitions of: cerebrotendinous xanthomatosis on an axial T2-weighted sequence through the posterior fossa (a) demonstrating white matter signal hypointensity involving the dentate nuclei and surrounding hyperintensity. Note the diffuse volume loss of the cerebellum disproportionate to the visible temporal poles. Metachromatic leukodystrophy on an axial T2-weighted sequence through the centra semiovale (b) demonstrating widespread symmetrical white matter signal hyperintensity sparing the subcortical U fibres and radiating transmedullary bands. Mitochondrial encephalopathy lactic acidosis and stroke-like episodes on an axial FLAIR sequence (c) demonstrating swelling and patchy hyperintensity of the cortical and subcortical matter of the occipital, right mesencephalic and left lateral temporal regions during an acute stroke-like episode. Adult polyglucosan body disease on an axial (d, e) and sagittal (f) FLAIR sequences demonstrating diffuse periventricular and inferior callosal white matter hyperintensity and volume loss. There is similarly cerebellar and spinal cord volume loss. An incidental planum sphenoidale meningioma is present. Vanishing white matter disease on axial and sagittal T2-weighted (g, i) as well as coronal T1-weighted (h) sequences demonstrating diffuse white matter T2-weighted hyperintensity and volume loss. Atrophy of the corpus callosum and spinal cord is also present. A common cause of white matter change is small vessel cerebrovascular disease. Leukodystrophies, as with the mother of this patient, may be diagnosed as vascular dementia. While small vessel ischaemia can cause very significant white matter change, red flags include: extensive changes in the absence of significant vascular risk factors and the absence of basal ganglia or brain stem involvement. Cerebral amyloid angiopathy can also lead to white matter changes; here, T2* or susceptibility weighted imaging can be helpful in demonstrating ‘microbleeds’ which are typically peripherally located. There have been reports of white matter change particularly involving the parieto-occipital regions in patients with duplication of the amyloid precursor protein.44 MRI changes of other differential diagnoses include the simultaneous enhancement of lesions and punctiform parenchymal involvement seen in sarcoidosis; mass effect and ring enhancement seen in abscesses; and bilateral non-progressive lesions at the grey–white matter junction in acute demyelinating encephalomyelitis. Returning to the case study and considering points (A)–(D) above, of particular note is the history of early onset dementia in the patient's mother, although definitive diagnostic information was lacking and there was no suggestion of other family members having been affected. Often the family history is censored or unclear. In this case, the history is consistent with maternal or dominant inheritance (A). From table 1, the four principal leukodystrophies associated with an autosomal dominant inheritance are: hereditary diffuse leukoencephalopathy with neuroaxonal spheroids (HDLS), cerebral autosomal dominant arteriopathy with subcortical infarcts and leukoencephalopathy (CADASIL), Alexander disease and adult onset autosomal dominant leukodystrophy (ADLD). The ethnicity provided no additional information (B). Our case had no features of migraine or stroke-like episodes to suggest CADASIL; no bulbar/pseudobulbar involvement or morphological features (eg, macrocephaly) to suggest Alexander disease; and no autonomic involvement to suggest ADLD (C). The MRI (D), which showed widespread white matter change with a frontal predominance and atrophy of the corpus callosum, was most suggestive of HDLS or ADLD. Other leukodystrophies with frontal predominance (table 3) include metachromatic leukodystrophy (MLD); however, this has an autosomal recessive pattern of inheritance. At this stage, it is appropriate to proceed to more specialist Round 2 investigations (table 4). From table 1 it can be seen that (fasting) very long chain fatty acid (VLCFA) levels, relevant white cell enzyme activities, cholestanol profile, urine bile alcohols and plasma amino acids should be measured as these will screen for the more common metabolic leukodystrophies. In particular, ALD has the highest prevalence at 40/million apart from the combined mitochondrial disorders, and should be tested early. Before testing, it is advisable to contact the local specialist laboratory to discuss the type of sample required, the optimum timing of samples and the storage/transport conditions required to ensure integrity of the sample for testing. In order to aid interpretation of the results, the laboratory should be informed of the age of the patient, the age of onset of the symptoms, and a summary of relevant clinical findings and family history. A list of concomitant medications should be given as these may influence some of the analytical measurements or modify metabolic processes. In our case, VLCFA and white cell enzyme activities were normal. Genetic testing for Alexander disease was negative. Over the next 12 months the patient continued to deteriorate. Discussions were held with the patient's family regarding the possibility of a brain biopsy, principally to exclude the remote chance of an inflammatory disorder, but this was declined. The patient was given a trial of oral steroids, but failed to improve. During this time, mutations in the colony stimulating factor 1 receptor (CSF1R) gene, responsible for HDLS, were identified.45 Sequence analysis of the patient's DNA subsequently identified a single mutation (E847D) in the CSF1R gene, confirming the diagnosis. The flow diagram in online supplementary figure S2 summarises the investigative process. If no abnormalities are found on biochemical testing or if a diagnosis not known to be associated with any biochemical findings is suspected, then it may be appropriate to proceed to genetic testing. This may be by a single gene analysis or analysis of a panel of candidate genes, depending on clinical suspicion and/or resources. Some centres may also have access to next generation sequencing technologies such as whole exome sequencing, and it is likely that gene chips which can be designed to detect the genetic defects causing a range of different disorders in parallel, in a cost effective manner, will have a major impact on the diagnosis of these and related conditions.46 At time of writing, mutation analysis of the following genes associated with leukodystrophies is available clinically (NHS) within the UK: ABCD1, ARSA, CSA, ERCC6, GALC, GBE1, GFAP, NOTCH3 and PLP1. Further details are available online (http://ukgtn.nhs.uk/). Diagnosis of mitochondrial disorders is coordinated via three specialist centres within the UK (http://www.mitochondrialncg.nhs.uk/). When should a brain biopsy be considered? A review of the seven most recent series in evaluating cryptogenic neurological diseases with brain biopsy estimated a yield rate between 29% and 65%.47 The rate was increased to 78% in the Gilkes et al47 series, by biopsing a radiologically identified lesion, in particular with contrast enhancement. Biopsy not only helps in reaching a diagnosis, but can alter clinical management. Rice et al48 found that management was altered as a result of biopsy in 63% of their cases. The modern risk of stereotactic brain biopsy has been estimated at 10–20%,49 with complications including seizures, intracranial infection and haemorrhage, but no long term neurological sequelae. Ideally a panel comprising a neurologist, neurosurgeon and neuroradiologist should discuss the optimal site for biopsy and ensure that the neuropathologist is aware of the clinical phenotype, imaging findings and family history to guide pathological evaluation. Algorithms have been suggested in the literature to aid decision making in presentations such as dementia49 and cryptogenic neurological conditions,47 ,48 but there are none specific to leukodystrophies. We feel that a biopsy in a suspected leukodystrophy should be considered under the following circumstances: the patient is deteriorating and a potentially treatable condition is being considered and/or all other investigations have failed to reach a diagnosis and it could aid in the management of other family members with or at risk of the condition. We now summarise the clinical presentation and MRI findings for the most frequently diagnosed adult onset leukodystrophies and important non-classical leukodystrophies including CADASIL and mitochondrial conditions. A more detailed discussion of the complexities of mitochondrial disease is beyond the scope of this article, but a number of references are given. When considering a specific leukodystrophy, it should be noted that often the presentation can be non-specific, but certain symptoms and signs and MRI patterns can be used together to help formulate a differential diagnosis and aid investigation. Clinical presentation: Adult onset cerebral ALD usually presents with psychiatric features followed by dementia, ataxia, seizures and death.2 This may occur on the background of adrenomyeloneuropathy (AMN), a slowly progressive spastic paraparesis, neurogenic bladder and bowel dysfunction, sexual dysfunction and peripheral neuropathy.50 Adrenal insufficiency is frequently associated. About 20% of female X linked ALD carriers develop symptoms, usually in their fourth decade, of an AMN-like phenotype, but only very rarely do they have adrenal insufficiency. MRI features: White matter abnormalities are usually first seen in occipital regions, with early involvement of the splenium of the corpus callosum and posterior limbs of the internal capsule.50 The changes then progress to involve more anterior regions. In cerebral ALD, contrast enhancement at the periphery of the signal abnormalities is said to be characteristic.8 In AMN, the posterior limbs of the internal capsules are frequently involved along with cerebellar and brainstem white matter.51 Spinal cord atrophy may develop. Brain involvement on MRI is very rarely described in women with an ABCD1 mutation. A review of brain MRI imaging in 76 affected women found changes consistent with male patients with cerebral ALD in only two women.52 Although the authors attempted to exclude other known causes of leukodystrophy at the time, the possibility remains that these changes may in fact have been related to a second undiagnosed condition. Clinical presentation: Typically, patients present with migraine with a mean age at onset of 30 years;6 ischaemic events usually have their onset in the late 40s. As microvascular changes progress, patients develop cognitive and psychiatric symptoms and seizures. MRI features: Posterior predominant white matter changes, with sparing of the U fibres and involvement of the splenium of the corpus callosum, are typically seen. A pattern of radiating stripes of normal signal intensity is seen in the cerebral white matter.57 T2 hyperintense changes are seen along the corticospinal tracts58 and the posterior limb of the internal capsule and the pyramidal tracts of the brainstem. On CT, hyperintensities are seen in the thalamus and basal ganglia; it is unclear what these hyperintensities on CT represent, but it has been suggested they may represent minute calcifications. 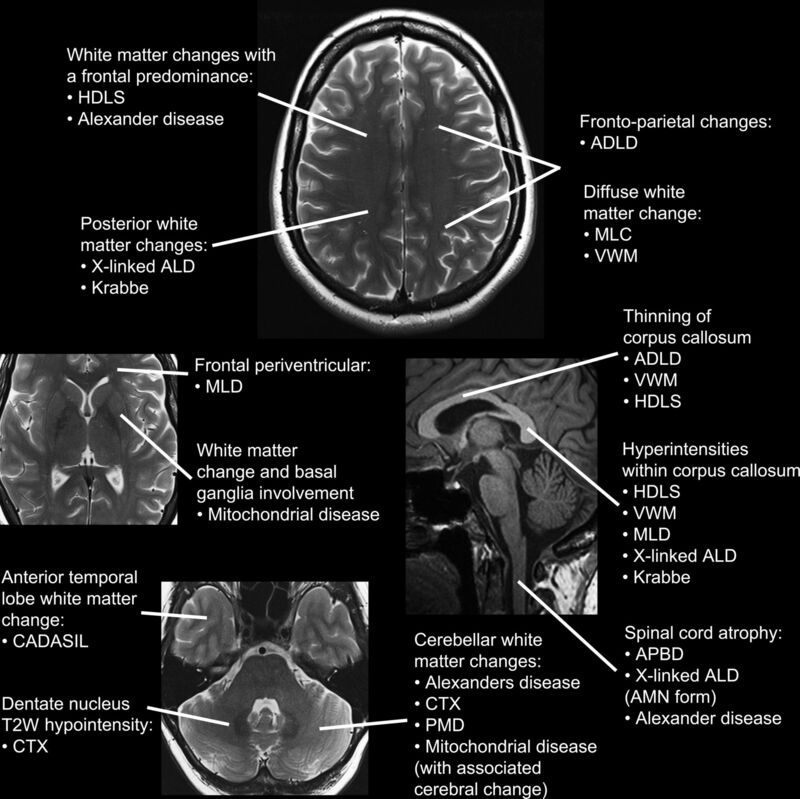 White matter involvement is increasingly recognised as a common finding in mitochondrial disorders, both those associated with alterations in mitochondrial DNA, which include Leigh disease, Kearns Sayer syndrome, mitochondrial encephalopathy lactic acidosis and stroke-like episodes, mitochondrial neurogastrointestinal encephalomyopathy and Leber's hereditary optic neuropathy, as well as those associated with mutations in nuclear DNA (typically in genes of DNA repair proteins), which are transmitted in a Mendelian pattern. While not traditionally classified as a leukodystrophy, these disorders form an important aspect of the differential diagnosis in this context. Clinical presentation: Clinical presentation can occur at any stage of life, and many of these disorders have characteristic features, although most present with multi-system involvement.64 Although mitochondrial DNA is inherited by a maternal pattern, no family history may be present, new mutations may arise or heteroplasmy (the variation of mitochondria in the same organism) may result in a higher proportion of mutant mitochondrial DNA in one individual compared with the mother (or siblings inheriting the same mutation), such that the disease manifests earlier or with a different phenotype. Interpretation of the inheritance pattern is made even more difficult by disorders that result from mutations in nuclear DNA. Genetic testing: The diagnosis of a mitochondrial disorder involves clinical suspicion, laboratory testing and the use of these results to direct genetic testing. In the first instance, the clinical phenotype should be defined using history, examination, neuroimaging, neurophysiology, audiometry and cardiology and ophthalmological opinion and investigation. Blood tests measuring lactate and cerebrospinal fluid (CSF) examination should also be performed. The next crucial step is a muscle biopsy for which histochemical studies and biochemical analysis of mitochondrial respiratory chain complexes can be performed. These results can then direct the genetic sequencing analyses performed. McFarland et al64 provide a comprehensive overview and algorithm for genetic testing in mitochondrial disorders. Clinical presentation: Patients typically present in adulthood, with personality change, and cognitive impairment, particularly executive dysfunction and memory problems.66 Patients then go on to develop spasticity, gait problems (these may be an early feature), ataxia and urinary incontinence. Clinical presentation: Patients present with a mixed picture of spastic paraparesis, but also have signs of lower motor neurone involvement, and bladder dysfunction. They can also have cognitive impairment, ataxia and extra-pyramidal signs. Clinical presentation: In a review of the adult cases reported in the literature (36 cases),17 the most common presentation was with bulbar dysfunction, pyramidal involvement, cerebellar ataxia and sleep abnormalities. Palatal myoclonus, urinary abnormalities and autonomic dysfunction have also been reported. MRI features: Diffuse white matter T2 hyperintensities involving the frontal lobe, parietal lobe and middle cerebellar peduncle. There is atrophy of the brainstem and corpus callosum. Clinical presentation: At least 25 adult onset cases have been described in the literature.20 Features include spasticity, cerebellar signs, seizures and dementia. A third of patients presented with psychiatric symptoms.20 Female patients can also present with primary or secondary ovarian failure. There are limited case reports in adults; however, Pelizaeus–Merzbacher disease (PMD) is often on the differential diagnosis list due to the common presentation of spastic paraplegia. Clinical features: The adult type may present with a chronic neurological syndrome including tremor, ataxia and dementia.32 Heterozygote females are usually asymptomatic, but can present with gait abnormalities. There are reports of heterozygote females in their 40s developing clumsiness, excessive falling and gait disturbances (wide based gait), hyper-reflexia, tremor and extensor plantar responses.72 Hereditary spastic paraplegia type 2 is clinically distinct from PMD, but is also due to mutations in the proteolipid protein (PLP) gene. Pelizaeus–Merzbacher-like disease is clinically indistinct from PMD; however, patients are negative for the PLP mutation. This review highlights that there are a wide range of leukodystrophies.57 New genetic findings are being identified with advanced techniques, but many are as yet undiagnosable in life. OMIM74 is a useful resource for newly characterised leukodystrophies. Are there any specific treatments for adult onset leukodystrophies? Support is required for patients and families during the process of making a diagnosis and once it is made. Due to the late onset, many affected patients have already had their own children, and detailed genetic counselling is required to explain the full implications of a particular diagnosis. Nonetheless, this is a very active area of research and a number of clinical trials are currently underway worldwide. These include haematopoietic stem cell transplant (ALD, MLD, Krabbe disease, Tay–Sachs disease), human placental-derived stem cell transplant (ALD, MLD, Krabbe disease), intrathecal enzyme replacement therapy (MLD), intracerebral gene therapy (MLD), haematopoietic stem cell gene therapy (MLD), allogeneic bone marrow transplant (ALD, MLD, Krabbe disease) and autologous haematopoietic stem cell transplant transduced with ABCD1 lentiviral vector (ALD). Further details can be found on http://www.clinicaltrials.gov, but it must be noted that not all studies are recruiting adult patients. Adult onset leukodystrophies represent a highly complex area of adult neurology, compounded by their rarity, with a total prevalence of 300 cases/million. There is a wealth of information on paediatric leukodystrophies, but adult onset cases can be misdiagnosed as atypical MS or young onset vascular or neurodegenerative dementia.66 In this overview, our aim is to describe a logical approach to the diagnostic process, reducing unnecessary (and expensive) investigations and using selectively the newer genetic advances. The authors would be happy to be contacted to discuss or see patients with possible adult onset leukodystrophies. The authors would like to acknowledge the UK National Institute of Health Research (NIHR) University College London Hospitals Biomedical Research Centres funding scheme, the NIHR Queen Square Dementia Biomedical Research Unit, The Medical research council (MRC) and Wellcome Trust. The Dementia Research Centre is supported by Alzheimer’s Research UK, the Brain Research Trust and the Wolfson Foundation.
. Clinical approach to leukoencephalopathies. Semin Neurol 2012;32:29–33.
. Leukodystrophies: classification, diagnosis and treatment. Neurologist 2009;15:319–28.
. Leukodystrophies: pathogenesis, diagnosis, strategies, therapies, and future research directions. J Child Neurol 2003;18:578–90.
. X linked adrenoleukodystrophy. Nat Clin Pract Neurol 2007;3:140–51.
. Evolution of phenotypes in adult male patients with x-linked adrenoleukodystrophy. Ann Neurol 2001;49:186–94.
. The minimum prevalence of CADASIL in northeast England. Neurology 2012;78:1025–7.
. CADASIL. Lancet Neurol 2009;8:643–53.
. Leukoencephalopathies associated with in born errors of metabolism in adults. J inherit metab dis 2008;31:295–307.
. Galaclosylceramide lipidosis globoid cell leukodystrophy (Krabbe disease). In: Scriver CR, Beaudet AL, Sly WS, et al., eds. The Metabolic and molecular bases of inherited disease. 8th edn. New York: McGraw Hill 2001:3669–94.
. Multiple mutations are responsible for the high frequency of metochromatic leukodystrophy in a small geographic area. Am J Hum genet 1995;56:51–7.
. Cerebrotendinous xanthomatosis, possible higher prevalence than previously recognized. Arch Neurol 2005;62:1459–63.
. Clinical and genetic spectrum of mitochondrial neurogastrointestinal encephalomyopathy. Brain 2011;134:3326–32.
. Prevalence of mitochondrial DNA disease in adults. Ann Neurol 2008;63:35–9.
. Mitochondrial syndromes with leukoencephalopathies. Semin Neurol 2012;32:55–61.
. Adult onset leukoencephalopathy with axonal spheroids and pigmented glia can present as frontotemporal dementia syndrome. Dement geriatr cogn disord 2011;32:150–8.
. Stable neuropsychological deficits in adult polyglucosan body disease. J Clin Neurosci 2007;14:473–7.
. Adult onset Alexander disease: a series of 11 unrelated cases with review of the literature. Brain 2008;131:2321–31.
. Leukoencephalopathies in adulthood. Semin Neurol 2012;32:85–94.
. MR characteristics and neuropathology in adult onset autosomal dominant leukodystrophy with autonomic symptoms. AJNR Am J Neuroradiol 2006;27:904–11.
. Natural history of adult onset eIF2B related disoders: a multi centric survey of 16 cases. Brain 2009;132:2162–9.
. Cerebral autosomal recessive arteriopathy with subcortical infarcts and leukoencephalopathy (CARASIL): from discovery to gene identification. J Stroke Cerebrovasc Dis 2011;20:85–93.
. Neuropsychiatric aspects of the adult variant of Tay Sachs disease. J Neuropsychiatry Clin Neurosci 1998;10:10–19.
. Clinical and genetic heterogeneity in megalencephalic leukoencephalopathy with subcortical cysts. Neuropediatrics 2003;34:215–18.
. Methylenetetrahydrofolate reductase deficiency (homocystiuria type II) as a rare cause of rapidly progressive tetraspasticity and psychosis in a previously healthy adult. J Neurol 2008;255:1845–6.
. Adult alpha mannosidosis. Clinical progression in the absence of demyelination. Neurology 2004;63:1744–6.
. Mucolipidosis type IV; a mild form with late onset. Am J med genet 1993;47:392–4.
. Central and peripheral nervous system dysfunction in the clinical variation of Salla disease. Neurology 2000;55:99–104.
. Late onset neurologic disease in glutaryl- CoA dehydrogenase deficiency. Neurology 2005;64:2142–4.
. Dystonia, tremor, and parkinsonism in a 54-year-old man with 2- hydroxyglutaric aciduria. J Neurol Neurosurg Psychiatry 2004;75:1362–3.
. 3-methylglutaconic aciduria type 1 causes leukoencephalopathy of adult onset. Neurology 2006;67:1895–6.
. 3 Hydroxy 3- methylglutaryl CoA lyse deficiency in an adult with leukoencephalopathy. Ann Neurol 2004;56:727–30.
. Two autopsy cases with Pelizaeus- Merzbacher disease phenotype of adult onset, without mutation of proteolipid protein gene. Acta Neuropathol 2000;99:7–13.
. Primary progressive multiple sclerosis as a phenotype of PLP1 gene mutation. Ann Neurol 2005;58:470–3.
. Pelizaeus- Merzbacher like disease: female case report. Rain dev 1996;18:114–18.
. Leukoencephalopathy with brainstem and spinal ord involvement caused by a novel mutation in the DARS2 gene. J Neurol 2012;259:292–6.
. Nasu- Hokola disease: the first case reported by Nasu and review. Neuropathology 2010;30:463–70.
. A comprehensive description of the severity groups in cockayne syndrome. Am J Med Genet 2011;155:1081–95.
. Oligoclonal bands and cerebrospinal fluid markers in multiple sclerosis: associations with disease course and progression. Mult Scler 2013;19:577–84.
. An MRI based approach to the diagnosis of white matter disorders. Neurology 2009;72:750–9.
. Diagnostic algorithm for the differentiation of leukodystrophies in early MS. J Neurol 2008;255:123–6.
. MRI and the diagnosis of multiple sclerosis: expanding the concept of “no better explanation”. Lancet Neuol 2006;5:841–52.
. Application of the 2010 revised criteria fort he diagnosis of multiple sclerosis to patients with clinically isolated syndrome. Eur J Neurol 2013. epub ahead of print.
. Tumefactive demyelination: an approach to diagnosis and management. J Neurol Neurosurg Psychiatry 2013;84:1047–53.
. Phenotype associated with APP duplication in five families. Brain 2006;129:2966–76.
. Mutations in the colony stimulating factor 1 receptor (CSF1R) gene cause hereditary diffuse leukoencephalopathy with spheroids. Nat Genet 2012;44:200–5.
. Validation of next-generation sequencing technologies in genetic diagnosis of dementia. Neurobiol Aging 2014;35;2615.
. Brain biopsy in benign neurological disease. J Neurol 2012;259:995–1000. , et al. Brain biopsy in cryptogenic neurological disease. British J Neurosurg 2011;25:614–20.
. Brain biopsy in dementia: clinical indications and diagnostic approach. Acta Neuropathol 2010;120:327–41.
. Adrenoleukodystrophy: phenotype, genetics, pathogenesis and therapy. Brain 1997;120:1485–508.
. Diffusion weighted MR imaging in leukodystrophies. Eur Radiol 2005;15:2284–303.
. MRI and proton MRSI in women heterozygote for adrenoleukodystrophy. Neurology 2003;60:1301–7.
. Molecular genetics of Krabbe disease (globoid cells=leukodystrophy): diagnostic and clinical implications. Hum Mutat 1997;10:268–79.
. Clinical and neuroradiological findings in classic infantile and late onset globoid- cell leukodystrophy (Krabbe disease). Am J Med Genet 1996;63:209–17.
. Krabbe disease: genetic aspects and progress towards therapy. Mol Genet Metab 2000;70:1–9.
. Krabbe disease: neurophysiologic studies and MRI correlations. Neurology 2004;63:617–20.
. eds Magnetic resonance of Myelination and Myelin Disorders. 3rd ed. Berlin: Springer, 2005.
. MR imaging and proton MR spectroscopy in adult krabbe disease. AJNR Am J Neuroradiol 2000;21:1478–82.
. Cerebrotendinous xanthomatosis: clinical manifestations, diagnostic criteria, pathogenesis and therapy. J Child Neurol 2003; 18:633–8.
. Cerebrotendinous xanthomatosis: pathophysiological study on bone metabolism. J Neurol Sci 1993;115:67–70.
. Clinical and molecular genetic characteristics of patients with cerebrotendinous xanthomatosis. Brain 2000;123:908–19.
. Clinical symptoms of adult metachromatic leukodystrophy and arylsulfatase A pseudodeficiency. Arch Neurol 1995;52:408–13.
. Metachromatic leukodystrophy: a case of triplets with the late infantile variant and a systematic review of the literature. J Child Neurol 2010;25:572–80.
. A neurological perspective on mitochondrial disease. Lancet Neurol 2010;9:829–40.
. White matter involvement in mitochondrial diseases. Mol Genet Metab 2005;84:127–36.
. Hereditary diffuse leukoencephalopathy with axonal spheroids (HDLS): a misdiagnosed disease entity. J Neurol Sci 2012; 314:130–7.
. MRI characteristics and scoring in HDLS due to CSF1R gene mutation. Neurology 2012;79:566–74.
. Novel missense mutations in the glycogen branching enzyme gene in adult polyglucosan body disease. Ann Neurol 2000;47:536–40.
. Adult Polyglucosan body disease. Natural history and key magnetic resonance imaging findings. Ann Neurol 2012;72:433–41.
. Can MR imaging diagnose adult onset alexander disease. AJNR Am J Neuroradiol 2008;29:1190–6.
. Alexander disease: diagnosis with MR imaging. AJNR Am J Neuroradiol 2001;22:541–52.
. Pelizaeus-Merzbacher syndrome: neurocognitive function in a family with carrier manifestations. Am J Med Genet 2007;143A:1442–7.
. An MRI and MRS Study of Pelizaeus-Merzbacher Disease. Paediatr Neurol 1998;18:334–7.
. Cerebrotendinous xanthomatosis: clinical, electrophysiological and nerve biopsy findings, and response to treatment with chenodeoxycholic acid. J Neurol 1990;237:216–19.
. Neurological outcome in cerebrotendinous xanthomatosis treated with chenodeoxycholic acid: early versus late diagnosis. Clin Neuropharmacol 2013;36:78–83. Contributors RA, NF, JC: manuscript concept, manuscript writing and preparation; EM: manuscript writing and preparation; ID: manuscript writing and preparation, figure preparation and radiological input; MP, JS, CM, RL, HH, JR: manuscript writing and preparation.